Offering a huge variety of straight, overcasting, and decorative stitch patterns including four lettering fonts, the JUKI HZL-F600 makes creating beautiful apparel an easy and enjoyable task. You need to make quite a lot of adjustments before sewing. This machine is equally good for working with both thin and thick fabrics. 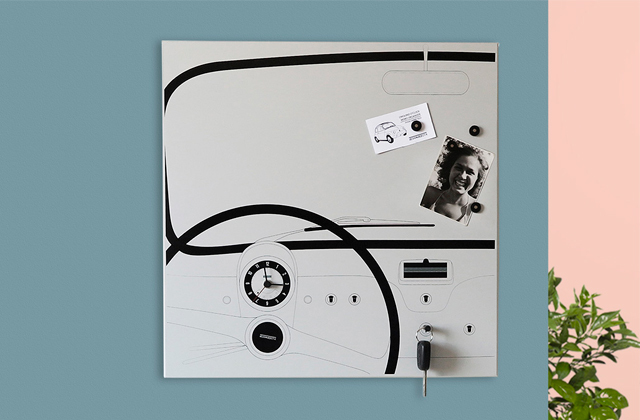 Thanks to a user-friendly control panel with an ergonomic LCD screen, you can select patterns and make other adjustments with just a push of a button. The buttonholes are automatically measured and sewed according to your chosen pattern (16 types are available). The reinforced 7-point steel transporter is made for industrial work on thick and rigid materials but it's just as compatible with thin and stretchy fabrics. The thread type helper is printed on the inner part of the machine's top and the letters aren't that big so they're tough to see. 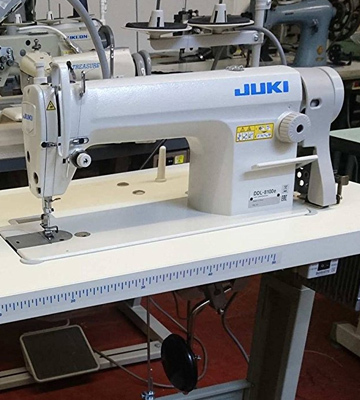 This model is definitely a bit overkill for basic clothes mending but if you want to manufacture clothes or have a big workload, the Juki HZL-G220 will absolutely blow through any task, delivering quality results. 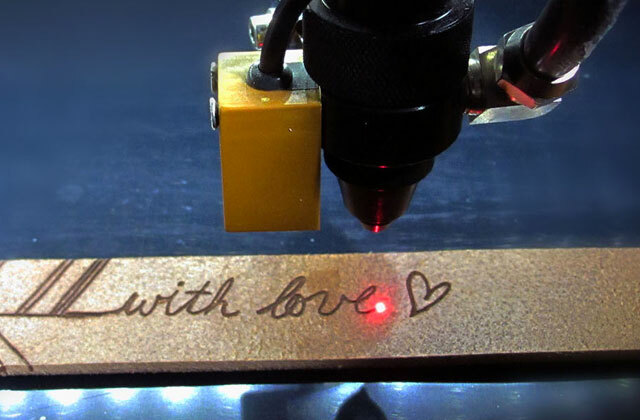 It works well with both delicate and thick materials, ensuring that your creations will be versatile and well-made. A good choice for any professional seamstress. The needle bar moves smoothly and, while it may take getting used to, work on this machine is less time- and energy-consuming than on many lighter models. The model is quite heavy and thus tough to install. It's difficult to say for sure whether you'll like the unusually floaty movement of the needle bar and the shuttle but it certainly saves time and makes precise stitching easier. If you need a machine that can work on thicker materials yet provide fine and delicate results - the JUKI DDL8100e is the right pick. The serger features the highest sewing speed and whisper-quiet operation if compared to the other models. The included sewing foot responds to a light touch. Quite short warranty time as for sewing equipment. This straightforward but still efficient serger is capable of stitching on the thickest fabrics. Perfect for sewers who work with heavy textiles. A low-priced sewing machine that is great for beginners and those who just want it for little projects. It's a bit less powerful than the other models in the lineup but it does the job well even if it takes a bit longer to do so. This is one of those rare cases where an introduction may be simply unnecessary. 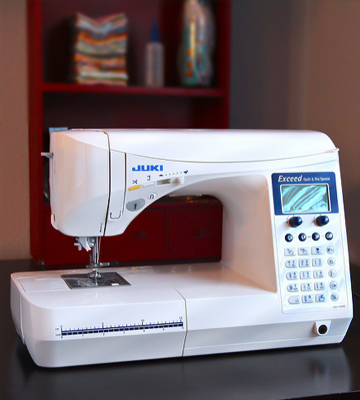 After all, the JUKI HZL-F600 is the flagship model of the brand, offering pretty much everything that you’d find in other devices of this kind and refining the sewing process to make it accessible and easy. For example, the machine will be a good fit for beginners thanks to an automatic threader and memory storage that saves up to 70 patterns. 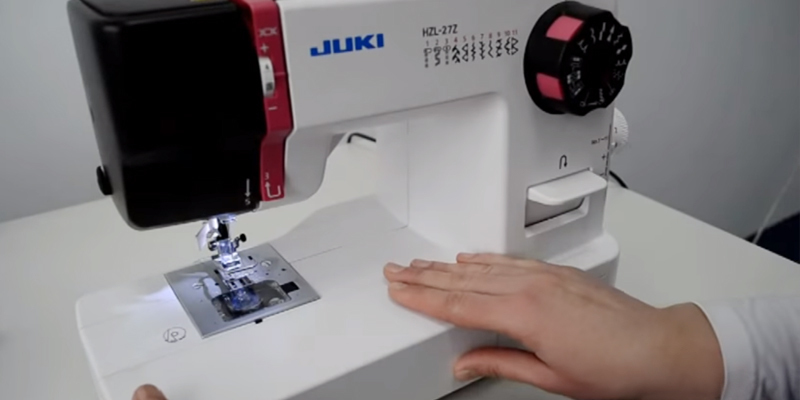 It wouldn’t be that much of an overstatement to say that the JUKI HZL-F600 practically guides your hand along the fabric. 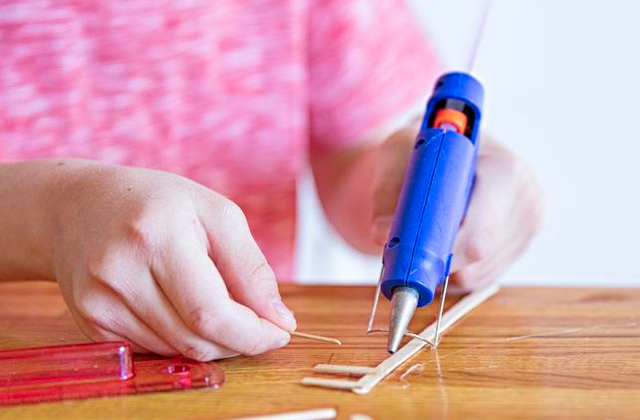 But don’t think that this model is only for amateurs as those with some skill can try the challenges of more complicated patterns and manual tension and stitch settings. You won’t have to settle for the same old presser foot as the machine has walking, quilt, open-toe, patchwork, edge sewing, smooth, and buttonhole feet. Still not enough? 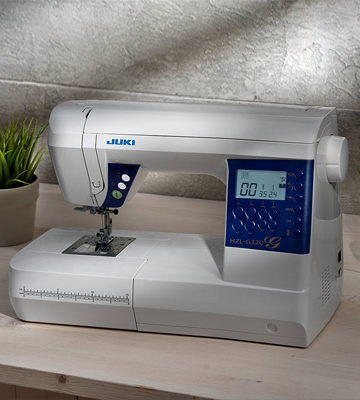 You’ll be happy to know that we only mentioned half of the foot choices so the JUKI HZL-F600 can certainly offer a toolset for any task, whether you’re stitching delicate patterns or fixing torn overalls. If there’s an area where the JUKI HZL-F600 doesn’t quite reach new heights it’s the stitches per minute parameter. We can’t exactly call 900 spm slow but some models from the JUKI company easily reach several thousand stitches per minute and it’s a bit baffling that such a high-end model can’t keep up. Though it may just be an acceptable sacrifice for the sake of precision. A single fault can’t bring down a great product and that certainly holds true for the JUKI HZL-F600. 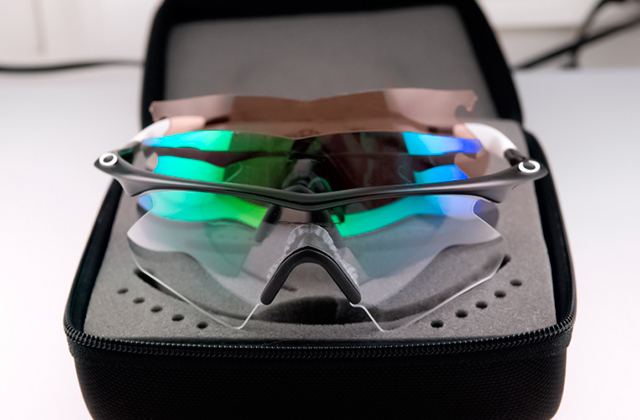 We recommend it to anyone regardless of the skill level though we have to admit that the price is a bit steep. 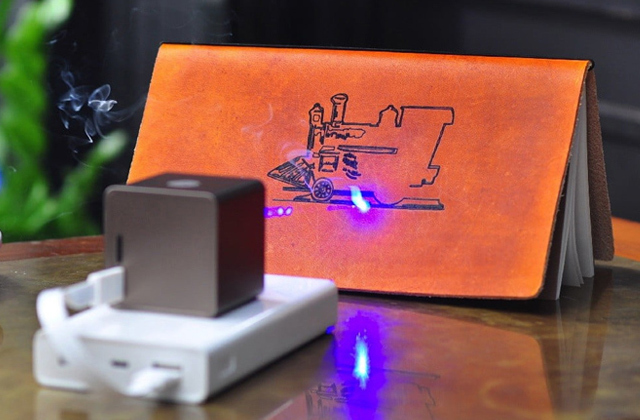 If you’re working with thicker materials like leather, rubber, PVC, and others, you shouldn’t be using a simple portable stitching appliance. That kind of task requires something sturdy and heavy-duty like a JUKI industrial sewing machine. 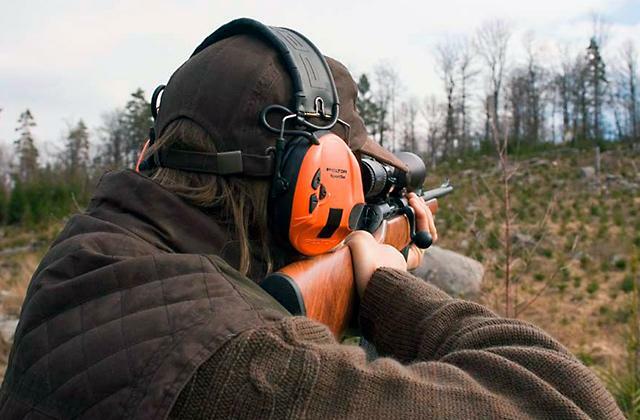 We recommend the JUKI HZL-G220 which manages to combine elegant and compact design with a truly powerful motor. What you get in the end is a device that can lay down stitches on practically any material. The machine comes with a pretty big kit that has all the right tools to work on sturdier fabric types. For example, you get a choice of 4 presser feet, each of them designed for different tasks. You can do edge stitching, manual buttonhole sewing, and much more. Since we’re looking at the JUKI HZL-G220 as a heavy-duty machine, we have to admit that the 900 spm speed level isn’t too impressive but it’s good enough for efficient work. Besides, the powerful low transporter is strong enough to move heavier materials and ensures that not a single stitch will be missed. Plus, the fabric doesn’t get stuck in the transporter so you can work on the most delicate materials without worrying about tearing them. These dual features are particularly important if you’re mass-manufacturing clothing and want to minimise the chances of poorly sewn pieces coming out of your work area. 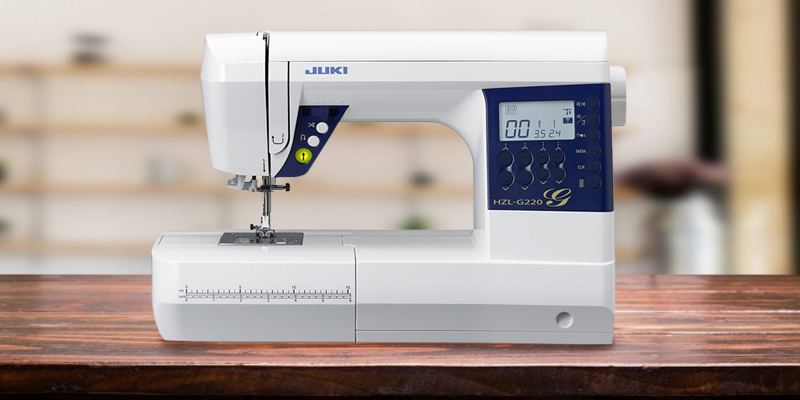 We feel like the high price and even higher power may be too much for simple home use but those working with large quantities of fabric including particularly tough or delicate materials should definitely turn to the JUKI HZL-G220 to make their task easier. A good sewing machine should stay firmly in its place when you work, which lightweight models don’t always manage. 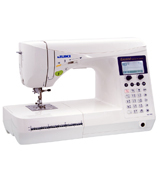 If you plan to stitch leather, curtains, or similarly thick materials, your best bet is the JUKI DDL8100e. This device is certainly on the heavy side and while it may be tough to install, once it’s set you’ll never have to worry about overworking the device. While the automatic lubrication system will keep the gears turning, your attention should be solely on the precision of your stitches. That should be easy enough as the maximum stitch length of 5 mm leaves plenty of room for fine work and edge sewing. The 3-row feed dog is adjustable so you can decide how much leeway you want for the fabric to move around. The needle bar on this model doesn’t just shift, it flows and the gentle movement makes any high-precision work feel simple. However, it takes a bit of getting used to as the floaty controls are certainly not something you see in every sewing machine. That’s why we don’t see this machine as a beginner’s choice unless you only plan to use devices with this control scheme. It’s tough to stand out from the array of the JUKI industrial sewing machine models but we did end up feeling like the JUKI DDL8100e accomplishes that. This device is heavier than most and has some unusual mechanical choices that may not be to everyone’s liking. However, if this machine strikes your fancy, chances are you won’t ever want to go back to any other models. 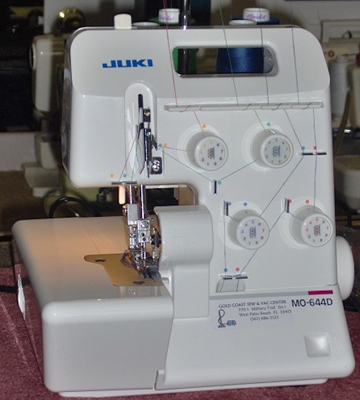 JUKI MO644D serger is one of the most reliable overlock machines for both novice and pro sewers. It features a variety of built-in stitch patterns and accessories to maximally simplify your sewing process. 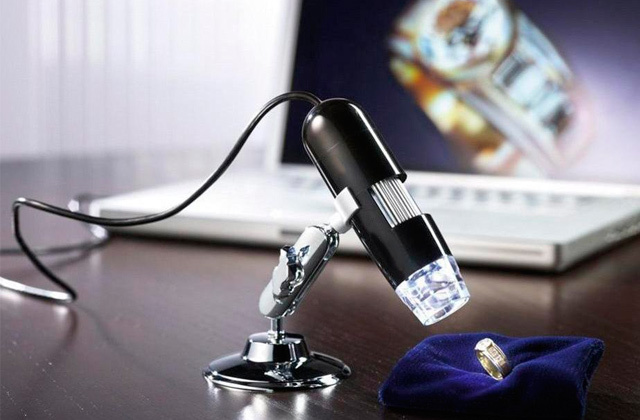 But the most outstanding thing about this model is it unrivalled sewing speed. 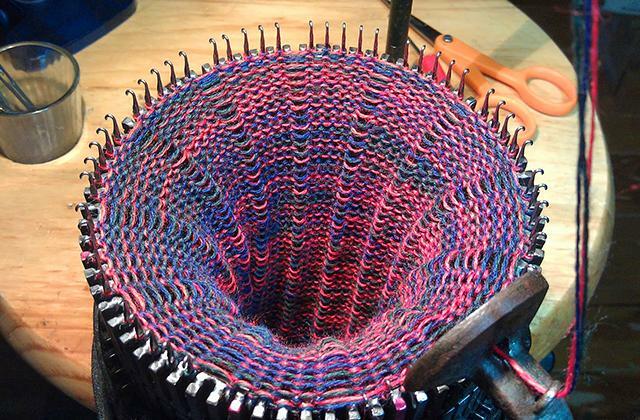 Just imagine how fast your projects can be completed at the speed of 1500 stitches per minute! By following the colour-coded threading guide printed on a looper door and on the machine's housing you wouldn't even need to refer to the manual all the time. When the machine is threaded you can easily adjust thread tension, stitch width, and differential speed on the right side of the machine's housing in order to create perfect seams on a fabric you work with. As regards the stitch length adjustment, you would need to open a side door and there adjust a special knob. That's probably the only tricky piece of work you'd face to do. We should also mention an automated rolled hem capability that would be highly appreciated by new sewers. The roll hemmer is built-in to the machine; it rolls and oversews the edge automatically, ensuring fine and narrow finishing. With the included all-purpose presser foot, you will be able to sew on most types of fabric and even install elastics, tape, and sequins into your garments. To sum up, JUKI overlock machine successfully combines durability and the variety of features in a single device. So, this high-efficient but still affordable model will be highly appreciated by both beginners and experienced sewers. 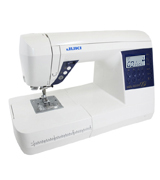 The JUKI HZL-27Z sewing machine offers you a wide variety of helpful features that give customers an opportunity to put into life their out-of-the-box ideas. This model has 22 stitch patterns and is equipped with a semi-automatic 4-step buttonhole. Owing to a big number of built-in stitches, you can use this machine for sewing stretch and elastic fabrics along with hemming clothing. The sewing speed about 550 stitches per minute is surely slower than the average speed of a professional sewing machine but more than enough for a novice user. 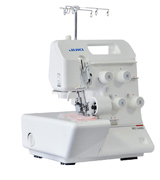 The most outstanding feature about the JUKI HZL-27Z sewing machine is the 7-point feed dog. It is able to sew through several layers of fabric without any problems. That's exactly why this heavy-duty sewing machine is the best choice for those who work with tough or thick fabrics. This sewing machine weighs only 13 pounds, so it can serve you as a portable sewing device and can be easily moved around. 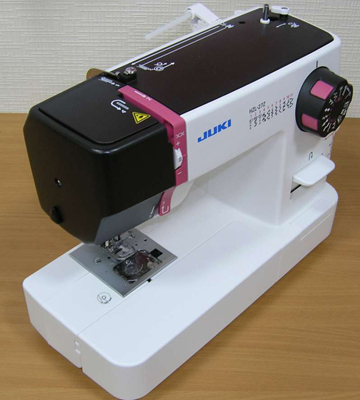 Additionally, the JUKI HZL-27Z features a horizontal shuttle and a top loading drop-in bobbin system with a clear cover. Hence, it is really easy to insert a bobbin and to replace the thread just in time. Moreover, the availability of the automatic needle threader simplifies the whole sewing process. We are sure that this very model will suit any tailoress. 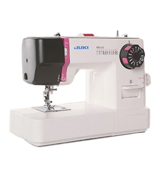 The JUKI HZL-27Z offers all the necessary features every sewing machine should have. The stitch length and width along with the thread tension may be adjusted by using the dial on the machine's body. This good sewing machine allows you to tuck a stitch (using the reverse option) or hem the T-shirt edges. You can even tailor narrow items like a sleeve cuff as the machine is equipped with a free-arm. 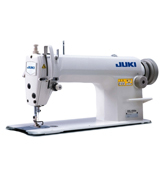 The JUKI HZL-27Z comes with only 2 presser feet: all-purpose and buttonhole. But if need be, you can purchase presser feet for other purposes, expanding your sewing opportunities. 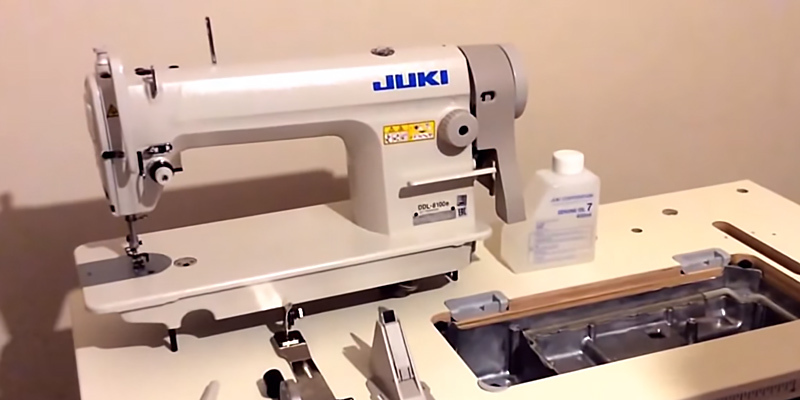 What Is a Juki Sewing Machine? You likely already know all about what a sewing machine is. After all, the appliance has been around for two centuries and almost 8 million name stitching and sewing as their core hobby. Of course, it’s become more than just a way to pass the time as a handy man or woman could use one of these appliances to fix clothes as well as create new ones out of a few scraps of cloth. Though, in fairness, you’d need something powerful for that, not just any old sewing device. Something like the Juki sewing machines, which hail from Japan and offer industrial-grade production efficiency and quality to match. 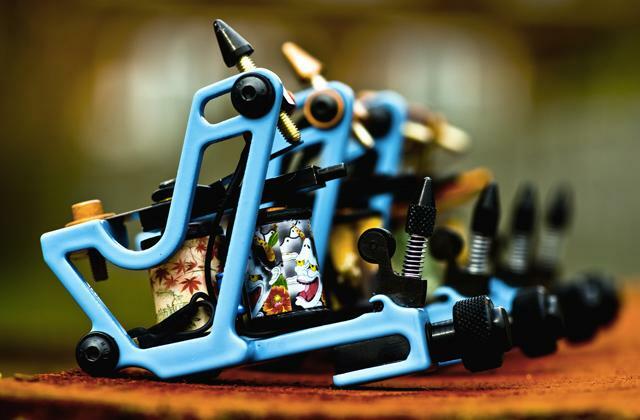 These models offer precise stitching with adjustable… Well, pretty much everything. 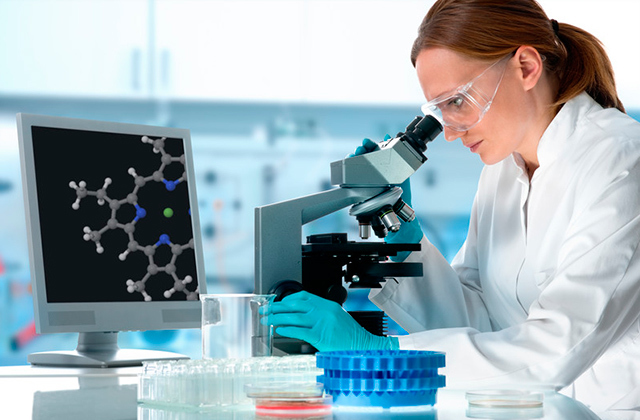 They come preprogrammed with several options to choose from and settings that you can tweak depending on your current project at hand. And they’re not that dissimilar to the starter machines that even a beginner can use. 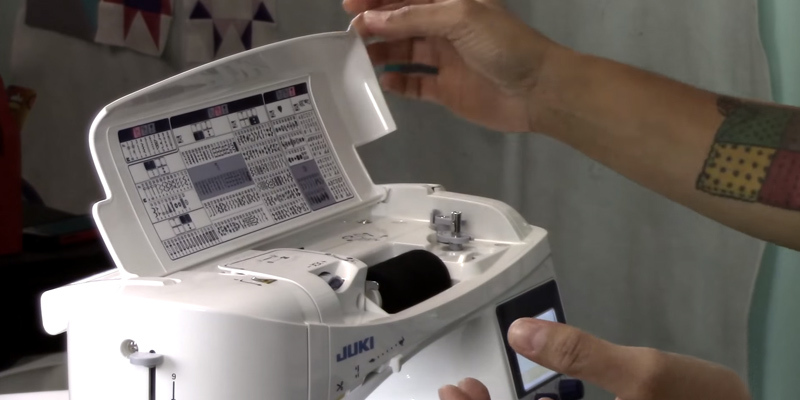 After you’ve learned some of the basics, a Juki sewing machine will be a good companion on your journey. 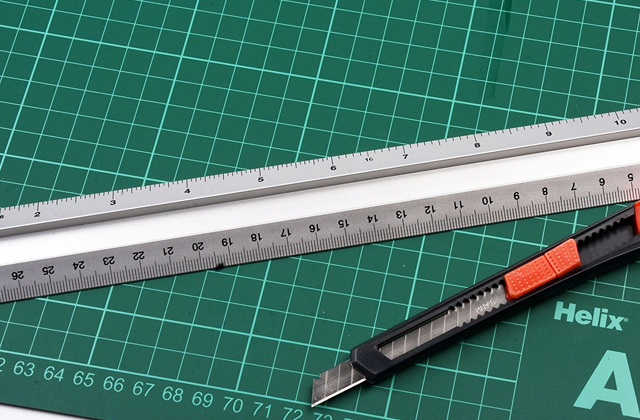 It’s also smart to get a cutting mat to make sure your handiwork is conducted in a safe manner. 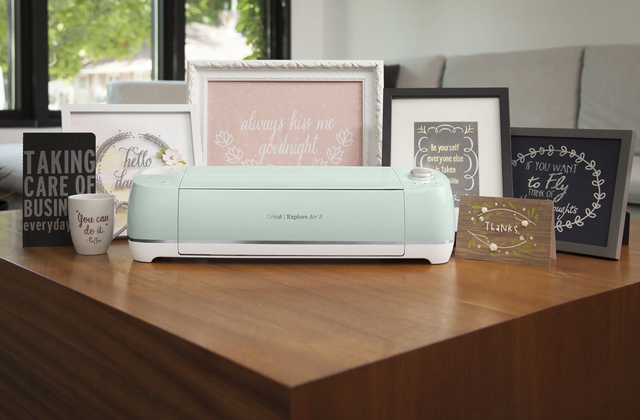 Oh and don’t forget to come back and check out some embroidery machines after you catch the crafts fever!